Apple recently removed the Camera+ app including a hidden feature that would allow users to utilize the iPhone’s volume buttons to take snap pictures. This is a feature that Apple has not allowed, as their guidelines do not allow devs to change the functionality of hardware buttons. However, it appears a new app has made its way into the App Store with the same functionality that got Camera+ removed. You better grab it before Apple removes it! 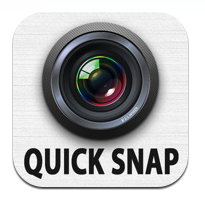 Quick Snap is available now for $1.99 on the App Store with it’s main advertised feature being the ability to “turn iPhone Volume Button into a Shutter button”. Apple has not commented as of yet, but its safe to assume the app won’t be available for long. The method is simple and practical. thinks!